More progress made today! 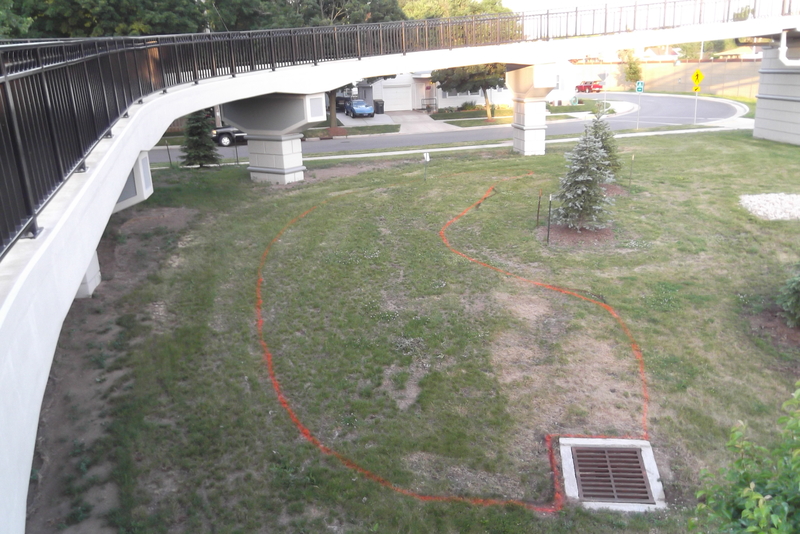 Janet and I finished adjusting markers to create a smooth outline that incorporates two sides of the storm drain. We spray painted in fluorescent orange, which shows up great. I stashed some cardboard under a tarp, hidden from the street by one of the ramp supports. Anyone who has or could acquire more cardboard, let me know. We will need lots! We will start laying it down this coming Saturday, June 17th about 9:30 (weather permitting)! Please let me know if you can come then, or if you could bring cardboard down there any time, and add it to the collection. Thanks! The Neighborhood Association received a permit in early April from the Wisconsin Department of Transportation (WisDOT) to create a garden of native prairie wildflowers and grasses to benefit butterflies and other pollinator species. This will be located at the end of Whenona Drive where the new pedestrian/bike bridge starts on the North side of the Beltline Highway. This garden will serve as habitat and food source for many butterfly larvae and adults, as well as native bees and other pollinators. Birds will benefit from seed sources, insects to feed their babies, nesting materials, and nesting sites. Because the City Parks department has responsibility for mowing the grassy area, we are working with them to lay out the garden in a way they can readily mow around. We are getting great advice and suggestions from experts at the U.W. Arboretum on what plants and seed mixes to use, and how to best proceed with the site preparation and planting process. We have permission to create approximately 1000 square feet of garden. This is expected to be an ongoing neighborhood/community project. We will soon be ready to lay out boundaries. If you love to get your hands in the dirt, or want to learn more about native wildflowers, please come and help us out! We will set a date for our first work session sometime in May. The plan for this first season is to prepare the site by smothering the weeds and grass with cardboard and mulch over the summer, and then in the fall, work up the soil and plant mainly seeds as well as some plants.